This is a great variation on sweet, traditional palmiers. If you keep puff pastry in the freezer it's a breeze to whip these up. I made fresh pesto with basil from the garden but used walnuts this time instead of pine nuts for an additional variation. Roll out the puff pastry to elongate slightly. 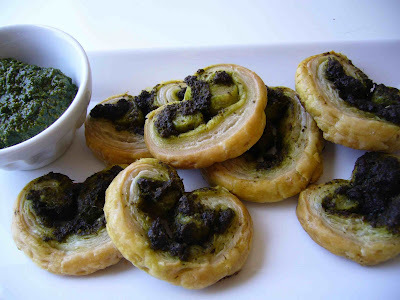 Spread the pesto on the puff pastry. Starting from two opposite sides, roll the sheet onto itself until the two rolls meet in the middle. Slice roll into 1/2" slices and lay flat on a baking sheet covered with a silpat or cooking spray. Bake 22 - 24 minutes until turning golden. Let cool slightly before serving with remaining pesto as a dipping sauce. Enjoy! Add the walnuts, basil, parmesan and salt to a food processor and with the processor running, drizzle the olive oil through the feed tube. Once well-blended, taste and add additional oil to reach desired consistency. Oh, I have got to make these!! Pesto is one of my favorite things in the whole world and one just can't go wrong with puff pastry. i love pesto! this appetizer looks sooo delicious! They would be so nice with a glass of something delicious!